Ever wondered how to paint concrete garage floors? We get asked all sorts of weird and wonderful questions relating to the world of sectional concrete garages. One subject that crops up quite often is how to paint concrete garage floors and indeed if in fact you can. 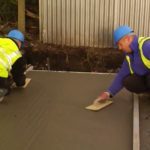 In short the answer is yes you can paint concrete garage floors, and quite often it can be a good idea and really enhance the look of a concrete garage. Why paint concrete garage floors? Unless your concrete garage and garage base are new there are likely to be all sorts of spills, stains and marks on it. Even a good clean is unlikely to remove the most stubborn paint and oil stains, so painting your concrete garage floor can really refresh the whole look of the garage. It’s also worth noting that plain concrete as a product creates quite a lot of dust, not something you want on all your possessions but something that can be eliminated when you paint a concrete garage floor. 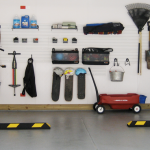 So what is involved in concrete garage floor painting? It may seem a simple undertaking to paint concrete garage floors. You might be surprised to find it’s a little more involved than just slapping any old paint on the floor. So this post will deal with a few do’s and don’ts of painting a concrete garage floor. Firstly, painting a concrete garage floor is relatively easy and inexpensive. However cost does depend on which type of product you decide to use, but we’ll come to that later. 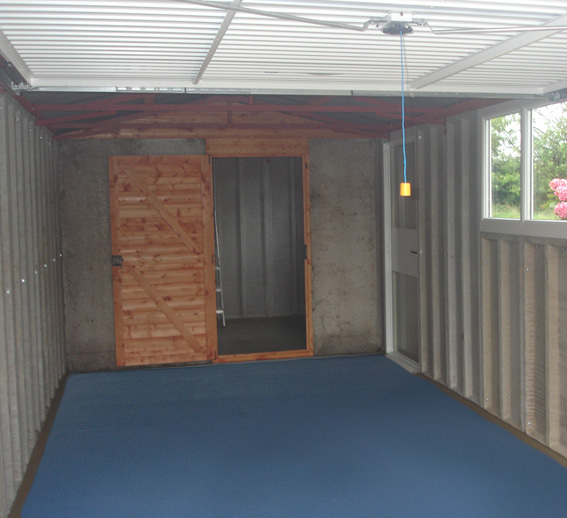 A painted concrete garage floor will also provide greater protection. Not just for the concrete but also against mould, mildew and spillages. Essentially there are three types of paint that can be used to paint concrete garage floors. Firstly there are oil based paints which tend to be at the cheaper end of the market. Then there are polyurethane based paints which are more durable than the oil based versions. Finally there are epoxy resin based paints that provide a really tough, durable finish for your concrete garage floor. Epoxy based garage floor paint is the most expensive option and the most involved to prepare and apply. Oil based garage floor paints can sometimes lift and flake off with heavy use. So they tend to need repainting more often than the harder wearing polyurethane and epoxy based paints. Whichever concrete garage floor paint you choose, they are all available in a variety of different colours. Step 1. Sweep the garage floor clean. Step 2. Scrape the floor to remove any particles or objects left after sweeping then apply a degreaser. Step 3. Fill any cracks in the concrete base either with a concrete repair compound or simply concrete. Step 4. Seal the concrete garage base with a pva based concrete sealing solution. This will help prevent any concrete dust contaminating the paint and also help the concrete garage floor paint to adhere to the floor. Step 5. Finally apply the concrete garage floor paint as per the manufacturer’s instructions. Most manufacturers would recommend applying the paint with a paint roller to get the best finish. 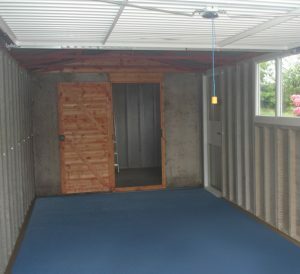 By following these simple instructions painting a concrete garage floor can be a quick, simple and inexpensive. It will also make the inside of your concrete garage look fresh and clean for years to come. To find out more about the UK’s largest range of sectional concrete garages please visit our product pages.